These days, customers want tailored offers that meet their specific needs. Evidently, the era of obtaining and using generic services is gradually fading away. In fact, nowadays the demand for tailored offers has become so serious that any company or business organization that isn’t ready to meet the personalized needs of the customers are very likely to face the risk of being dropped or substituted by another competitor. Some of the primary issues that businesses often face are — inability to build a strong brand identity, improving customer relations, gaining better investment returns to name a few. Thanks to digital and technological advancements, now businesses around the world have discovered new opportunities to attract and retain clients more efficiently. While the introduction of mobile devices and applications has graciously helped to change the way people communicate and do business, it is interesting to realize how user interaction with mobile devices can be effectively transformed if the process of Android app development is integrated with machine learning (ML). Recently, many app development companies have been able to develop a wide range of efficient and functional applications. These applications can effectively enhance user engagement thanks to the ingenious development of smart devices (including phones) that are dynamic enough to run apps capable of learning human behavior and reacting in real time. Emphatically, this invention was borne out of the desire to create and establish true individualization with mobile app development. Many app development companies have realized that without a functional mobile application that contains relevant pop-up ads and other prominent features, enterprises can hardly engage their target audience. As a result, many top app development companies have begun adopting cognitive technologies to design and develop operational algorithms and machines that are capable of identifying human behaviors, providing relevant assistance to users in their tasks, and even entertaining them in every possible way. Apart from taking android application development as their prime area of expertise, many Indian app developers are learning to adopt and integrate several other tech advancements into their projects. Basically, helpful technologies like machine learning (ML) can help to creatively bridge the gap of individualization that is inherent in Android application development today. Below are some interesting ways machine learning can be effectively integrated into mobile applications. Just so you know, achieving this can go a long way in helping to improve business growth and development. When it comes to developing apps for android devices and even other devices, data is extremely essential. Indian app developers looking to be successful in machine learning-enabled apps should ensure that they have adequate data to support the technology. Generally, interactive technologies like Machine Learning, Artificial Intelligence, and Big Data require adequate data to work efficiently. The best way to establish accurate results and predictions while providing ML features in Android app development projects is by providing sufficient data to the algorithm. This implies that the ML developer should employ all available data and avoid subsampling in every possible way. Selecting the most appropriate approach to machine learning (ML) is highly essential in determining the overall success of the development project. Simply put, Indian app developers need to know the right method to adopt. There are various approaches to integrating machine learning into Android application development. What matters most is the developer’s ability to adopt the most appropriate method. In a bid to achieve an easy learning process, it is generally advisable for developers and scientists alike to ensure that they adopt a simpler ML model. This will invariably help to bring about accurate predictions and results. Other than choosing the right approach and parameters, anyone can effectively achieve the best results by hiring the right data scientist and ML developer for the job. Just so you know, there are quite a good number of Indian app developers that have already begun building Android applications with machine learning capability configured inside. Having professionals like this in your development team can go a long way to help you create efficient mobile applications with high machine learning abilities. 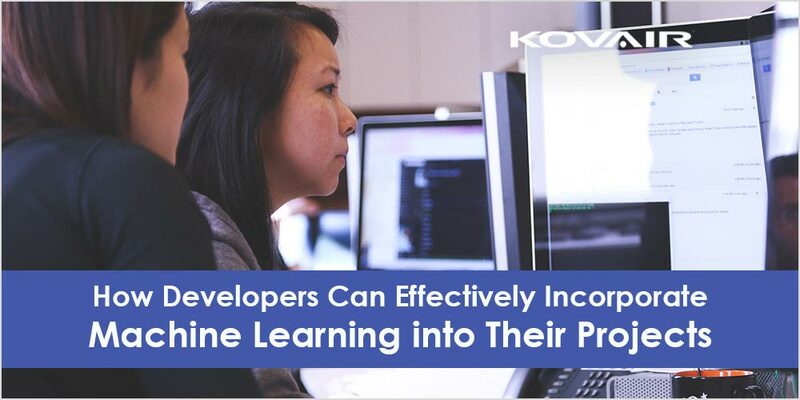 When implementing Machine Learning features in mobile app development, it is important for app development companies to avoid hurting prediction capabilities with improper data collection. The basis of machine learning is the data and as such developers much ensure that they adopt an efficient data collection strategy. However, it is important to have a proper understanding of the data features as well as its improvements. Without proper understanding, it will be very difficult for anyone to develop Android apps with learning processes and predictability capabilities. When building Machine Learning algorithms for Android applications, it is highly imperative for developers to not only consider the business model and production capacities but also ensure proper and careful testing. As a matter of fact, testing should be considered right from the planning stage to the final delivery stage. On a global scale, many Android app development agencies are already incorporating Machine Learning (ML) into their projects to provide assistance in building a consistent omnichannel experiences, maintaining customer loyalty, improving customer experiences, and making mobile platforms look more appealing, efficient, and user-friendly. When it comes to integrating Machine Learning in Android app development, understanding the benefits can help established and potential app developers to upscale their customer interaction in the long run.